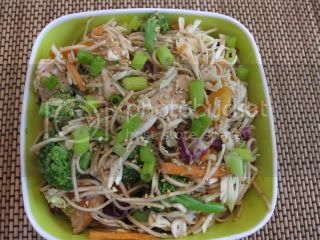 Sesame Chicken with Soba Noodles! My Mango Madness smoothie really didn’t hold me over very long this morning. After about an hour and a half I was pretty sure my stomach was going to eat itself. I think the difference in using lowfat milk versus lowfat greek yogurt is pretty big for keeping you satisifed. 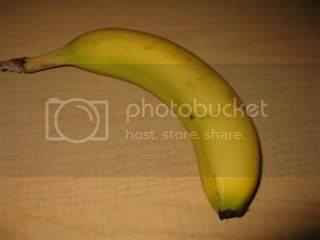 I managed to hold out until snacktime and had a banana. 45 minutes later I was STILL hungry. So, I had a couple of bites of my lunch since I knew too much would throw off my spinning class. No Biggest Loser barfing moments for me. By the way, Spinning was awesome today! I wish I knew the secret to having those perfect workout days where you just feel like you can go for hours. I came back to an amazing lunch that I prepared last night! 1. Marinate your chicken for 30 m to 2 hours and grill for about 20 minutes. 2. Prep your veggies and put a pot of water on to boil. 3. 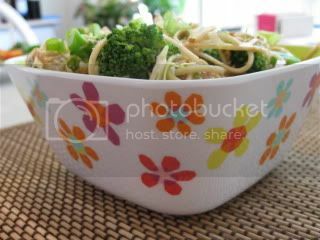 Add the soba noodles and broccoli cooking for ONLY 3 minutes, drain and run under cold water. 4. Mix everything together reserving the scallion and sesame seeds for toppers. 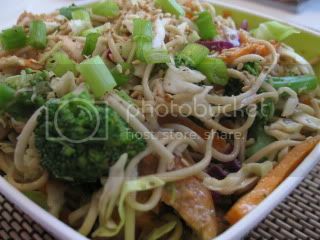 The star of the show was the soba noodles AND dressing! 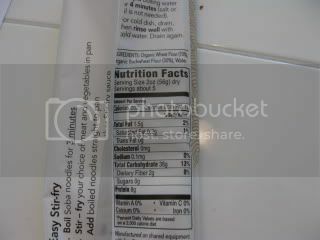 I used Organic Soba Nooldes (Buckwheat) that I found at a local grocery store in the health food section. I LOVED this salad and would totally make it again! It would be fantastic with some crushed peanuts added to it as well. You end up with equal parts cabbage and noodles but in the end, it seems like all noodles as the cabbage wilts. Perfectly cooked, crisp broccoli that cooked with the pasta. Presented in the super cute bowl that The Husband got me for Easter. Have a fantastic afternoon all ~ see you all later tonight! « The Bikini Bootcamp Book Winner is……. woo woo for the new fridge =)! how exciting!! I love the ginger sesame dressing! I think I'm going to make more and use it all week. It makes me happy! Love the salad pics. I am so bummed that I didn't get to finish making it today. I am saving it for tomorrow though. Looks good! 20 minutes until I start my Circuit Training for the day…go go go! Bummer about the old fridge dying but WOOHOO to the new one!! Wow~ That recipe looks absolutely fabulous! Yay for the new fridge! And YUM on your dinner!!! I'm glad spinning went well! That salad looks fabulous. I bet those soba noodles were so good! Good luck reorganizing the freezer– that's cool that you get a new fridge, though! 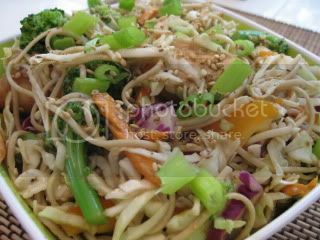 Wow the Sesame Chicken with Soba Noodles looks so good. Jenny ~ I am all too excited for the new fridge – so glad The Husband agreed to the model I LOVED. Angelea ~ This is a salad you definitley have to try – it might be one of my favorite ones yet! I LOVE that dressing too and will definitely make it post BBC. K ~ He does a good job picking out plates, placemats and such – better than me. Nutritious ~ it's definitely a recipe to try – it rocks! C.G. ~ Yeah for it all – I agree! 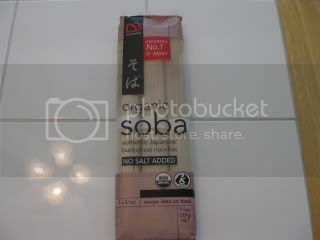 Anne ~ I really LOVE soba noodles – you should try them if you haven't. Melanie ~ it was so easy to make and tasty! I highly recommend trying it.